SHOCK ABSORBING PADDING IN KEY AREAS: The Drako Thunder shin guard offers high-density foam padding in the key areas needed the most. The Drako Thunder Shin Insteps offer high-density foam padding in the key areas needed the most. Made of durable polyurethane (PU), the layered core and padded instep with additional tibia padding provides extra shock absorption. With comfort and functionality, this instep is an excellent choice for athletes. 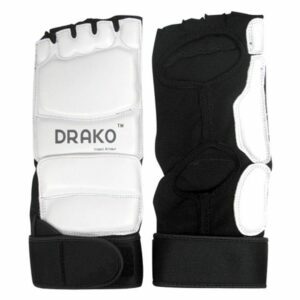 The Drako Thunder shin guard offers high-density foam padding in the key areas needed the most. The instep and shin portion have been singled out and given extra attention, with thick foam padding. This allows the shock of the impact to be dispersed away from the leg and to reduce injury. The outer shell of the Thunder instep is made with the finest synthetic leather materials on the market. It is lightweight, durable and helps against abrasions when in contact with other objects. Comfort is key when training & the Thunder shin guards give you all that and more. The back inner shin is laced with a soft and durable fabric that helps reduce irritation. The shin guard itself contours around the leg for a snug fit and doesn’t have a bulky feel, like some other shin guards. Drako uses high-grade threading when stitching and ensures all stress points are addressed for maximum life and durability. 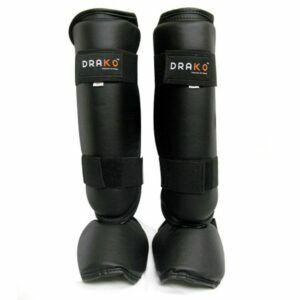 From novice to the expert users, the Drako Thunder shin guards come in at a price that is sure to appease anyone. Without taking away from quality and safety, these shin guards are definitely a “bang for your buck”. 1) What material is used in construction? 2) What protective qualities are unique to the model? 3) How easy is it to clean the product? 4) Tight, yet comfortable fit for mobility? 5) Is cheaper necessarily better? What aspects are you sacrificing for the price? 6) Are you paying more for the brand or the functionality? To feel confident in yourself, you must first feel confident in your equipment. We at Bushido recommend you make your own short list of questions, and be sure to feel confident in answering all of them before committing to bringing something new into your training regime!